Where I live folks take great pride in shopping locally. Anytime a big chain store wants to move into town, it is often met with strong protest. But here on my little hill, many independent neighborhood stores are struggling. Perhaps it is similar where you live. That's why I think the 3/50 project is brilliant. Started last spring by an inspired blogger, the project has received lots of press and momentum for good reason. 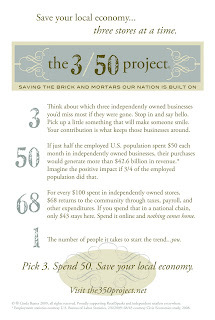 The goal of the project is to "save the brick and mortars our nation is built on" and stimulate local economies. 3: Think about which three independently owned businesses you’d miss most if they were gone. Stop in and say hello. Pick up a little something that will make someone smile. Your contribution is what keeps those businesses around. 50: If just half the employed U.S. population spent $50 each month in independently owned businesses, their purchases would generate more than $42.6 billion in revenue. * Imagine the positive impact if 3/4 of the employed population did that. 68: For every $100 spent in independently owned stores, $68 returns to the community through taxes, payroll, and other expenditures. If you spend that in a national chain, only $43 stays here. Spend it online and nothing comes home.